The BlackBerry Curve is a "candybar" style smartphone by Research in Motion. It has a full QWERTY keyboard, trackball navigation and large QVGA display for easy visibility. The memory slot is compatible with the microSD card. The Curve is compatible with GSM 850, 900, 1800 and 1900 or CDMA 850 and 1900 and is currently available for Alltel, AT&T, Sprint and Verizon. Blackberry 9300 - the first 3G curve. The easy way to download/put/import videos to BlackBerry Curve Smartphones. Today I could focus on the way to convert and play movies/musics on BlackBerry Curve. Now we have known that BlackBerry Curve Smartphones like BlackBerry Curve 8300, BlackBerry Curve 8900, Blackberry 9300, etc can play video in WMV, MP4, 3GP, etc and music in MP3, M4A, WMA, etc. So if we had lots of videos in other format, what we need is just a powerful BlackBerry Curve Video Converter for Mac, which can convert all movies/musics like Divx, XviD, AVI, TiVo, FLV, M4V, MOV, VOB, MTS, M2TS, MKV, WMV, MPEG, F4V, SWF, AC3, DTS, FLAC, OGG, etc to WMV, MP4, MP3, WMA, etc for playing on BlackBerry Curve Smartphones. Step 1: Download Aunsoft Mac Video to BlackBerry Curve Converter, install and run it. Step 2: Please click “Add” to import kinds of movies/musics you want to put on BlackBerry Curve Smartphones like BlackBerry Curve 8300, BlackBerry Curve 8900, Blackberry 9300, etc to this program. Step 3: Click the pull down icon of “Format” to select output format BlackBerry – BlackBerry Windows Media Video (*.wmv) or BlackBerry MP4 Series (*.mp4) for your BlackBerry Curve Smartphones. Then click folder icon of “Output” to choose the folder your want to save the converted files. Tip: Click “Settings” to set the Video/Audio Parameters like Size (resolution), bitrate, frame rate, etc to be more suitable for BlackBerry Curve Smartphones. For example: Set Size/Resolution to 480*360 pixels or others. 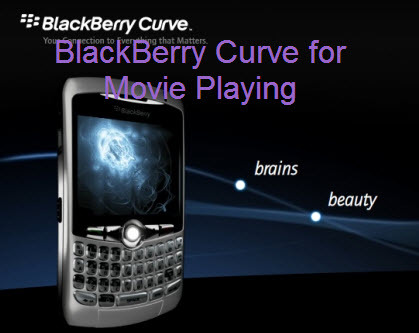 Step 4: Start the conversion from movie to BlackBerry Curve Smartphones. After conversion, you can put the music; put the movies on your BlackBerry Curve Smartphones like BlackBerry Curve 8300, BlackBerry Curve 8900, Blackberry 9300, etc for enjoying now. Tip: If you want to put and play DVD, Blu-Ray movies on your BlackBerry Curve Smartphones, you could select Aunsoft Blu-Ray Ripper for Mac. For Windows users, please choose similar products for PC. Now, thanks for your reading, and hope you could enjoy the program and well import and play movie/music on BlackBerry Curve Smartphones. How to Copy Blu-ray DVD Movies to NAS with Surround Sound?